I don’t consider myself a gal who has it all together but coming upon six years of homeschooling, I’ve had to navigate a speed bump or two. 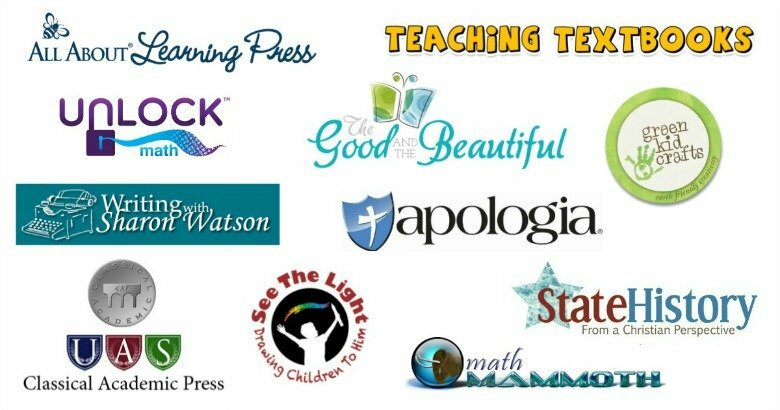 So much so that I wrote a book called Just for Today’s Homeschooling Mom: a whisper of encouragement when you need it most. 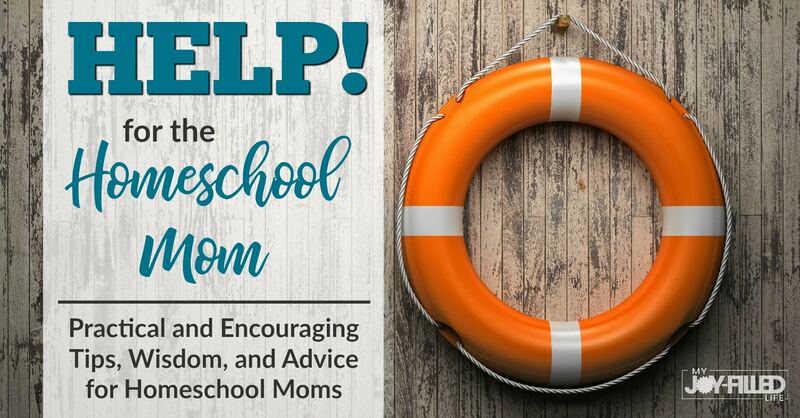 It’s packed with the not-so-talked-about topics that homeschooling moms deal with, one in particular that I want to talk to you about today. You’ve probably seen or heard that more times than you can count, but it’s something not so easily grasped. Sometimes there are seasons that aren’t so lovely. 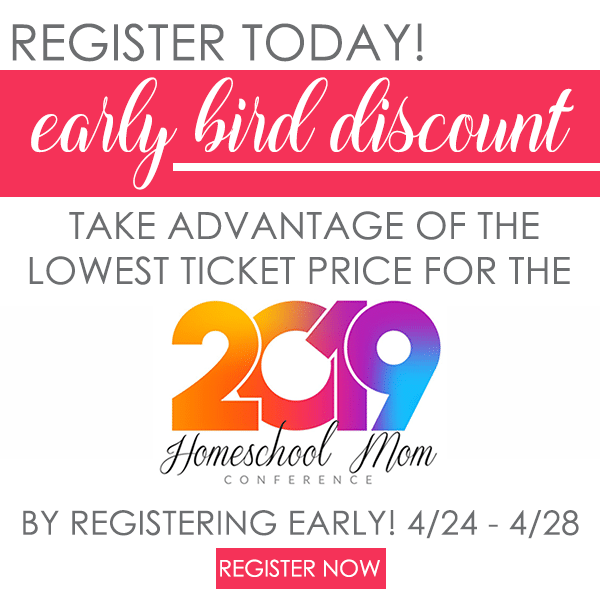 You know what I’m talking about… the season of having multiple kids in diapers, the season of trying to navigate homeschooling varying ages and abilities, or what about the season of juggling homeschooling, marriage, and a business? There are a lot of things that could be the cause of why it may be difficult to love the season you’re in, but here are 3 ways to do it regardless of your present (or future) circumstances. Have you ever been so unhappy about the season you’ve been in that you begin to focus on someone else’s life and the appearance of it all being well? I will be the first to admit that I did this so much that my reality became distorted with a fairy tale and imaginations of how I wished my life would be like. 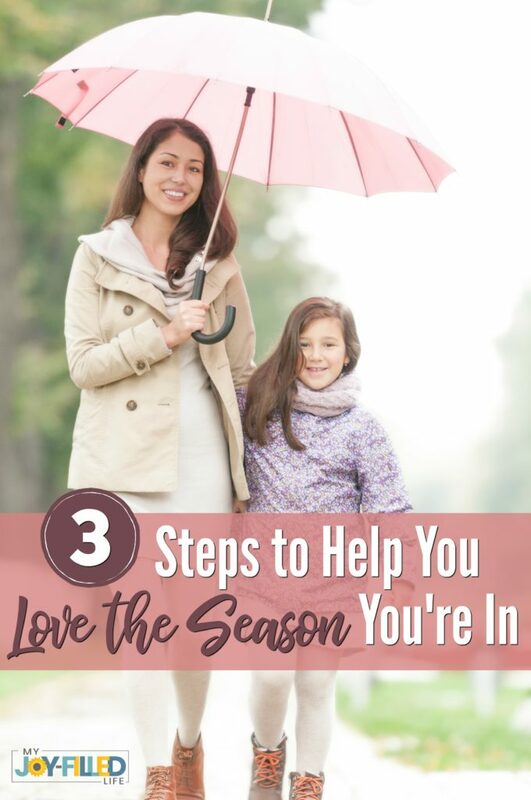 Ignoring your season simply because you aren’t happy with it is one sure way to send yourself, and possibly your family, into a downward spiral that can be difficult to navigate out of. You’re probably familiar with the comparison game, and as a homeschooling mom it seems to get played even more. My advice is to acknowledge the season you’re in, regardless of what it looks like. Acknowledging means you aren’t going to ignore it or wish it was different. It means you are deciding to not give room for something to squeeze in and wreak havoc. Acknowledging your season can then set you up for the next tip. Considering and acknowledging may sound like the same thing, but in this case, they are not. 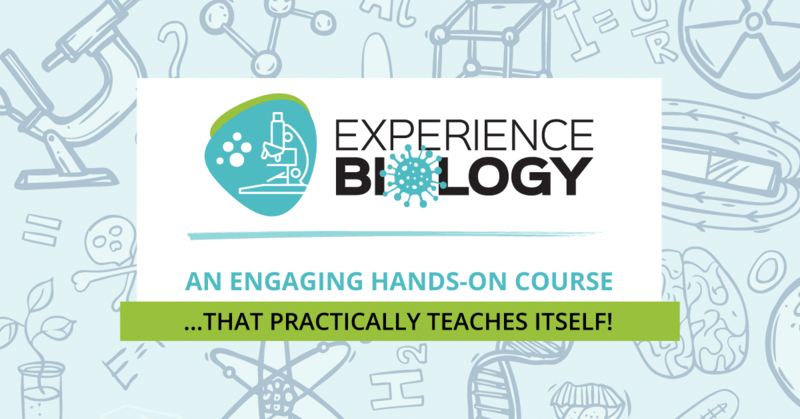 Acknowledging says, “Okay, I realize I am in a season of being a homeschooling mom of three children ages ten and under.” Whereas considering takes it to the next level that involves action. Considering is what I like to call the level of choosing how you will react to your season. 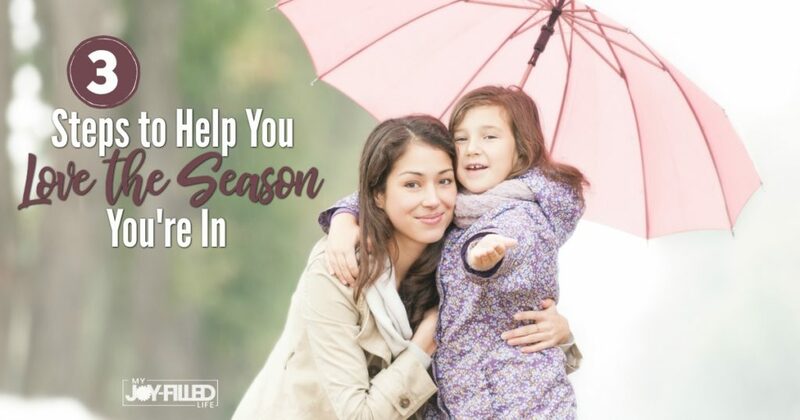 Taking into consideration the season you’re in says, “My life is filled with growth opportunity moments because I am homeschooling three children ages ten and under.” The reality of your season then comes to life with your unique circumstance and situation added to it – not someone else’s. You can then begin to operate and make good choices that have a direct and positive effect on your current season. A prime example is homeschooling a special need’s child. Instead of ignoring that fact, or wishing things were different, you can begin to embrace and consider the realities of what happens through joy and love. Then there’s navigating your unique season. It’s one thing to acknowledge, and it’s another to consider – but what about actually walking it out, especially with an attitude of joy and acts of love? I understand firsthand what it’s like to be an underappreciated wife, an overwhelmed mom, a clueless home educator, and a bombarded businesswoman. Talk about a season of wanting nothing more than to just give up! I also understand navigating the limiting beliefs and negative self-talk, chasing my dreams instead of what others wanted for me, and finding the confidence to walk boldly in my calling as a mentor, advisor, and servant. And here is what was life-changing for me (and what can be for you too) – I chose to love the season I was in regardless of how cold, rainy, sunny, or clear it was. I chose to acknowledge my season in every area. I chose to consider the possibilities of growing stronger as a wife, mother, and mompreneur. I chose, and still chooses today, to navigate each season with a mindset of joy and love. So the question now becomes, what season are you currently in and are you going to choose to acknowledge, consider, and navigate through it with joy and love? Michelle Huddleston is a Proverbs 31 wanna-be wife, a homeschooling mompreneur, and a woman with the burning desire to help other women learn to live unapologetically authentic. She is an author, lifestyle blogger, and mompreneur mastermind who wants to link arms with you to inspire, encourage, and empower you to walk boldly in your calling. 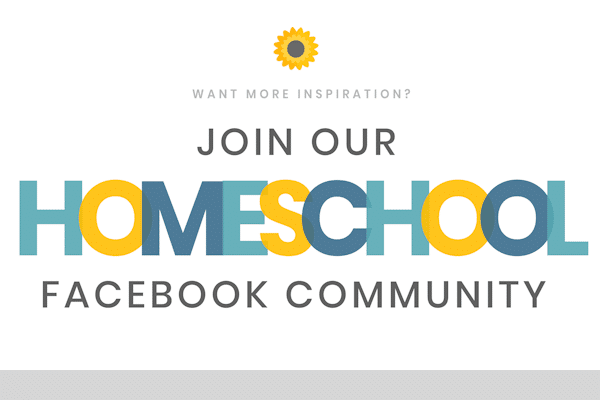 Michelle has a variety of tools, resources, and support for today’s homeschooling families, including an online Academy, a Shop full of educational resources, and a homeschool community Facebook group with a free COOP program. She is blessed to work side-by-side with her incredible husband in their endeavors to grow their businesses: With the Huddlestons, Huddleston Academy, and nonprofit organization More Than Minority. You can connect with Michelle across most social media platforms including: Facebook, Instagram, Pinterest, and YouTube. This is so good to remember every day! We’re always telling ourselves and our children to try to keep an “attitude of gratitude.” It really changes everything when you begin with thanking God for whatever is before you. This is what I needed to hear today. I notice that I start to get antsy or feel like I”m not doing enough for others, but that’s not where I’m at right now. That’s good! Keep on keeping on girlfriend!